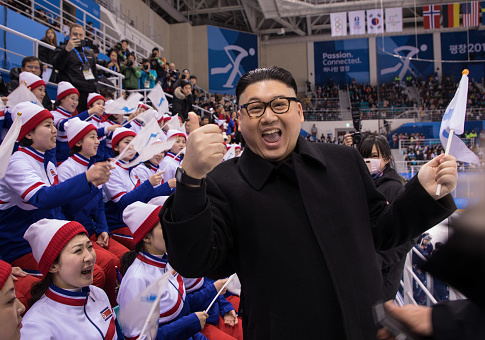 A Kim Jong Un impersonator did not impress a group of North Korean cheerleaders when he arrived at a hockey game between the unified Korean team and Japan on Thursday. The impersonator, identifying himself as "Howard," approached the 230-member cheerleading squad while waving a unified Korea flag. The initial response was icy, with several of the cheerleaders openly scowling and others sitting uncomfortably in silence. Howard, who is of Chinese and Australian descent, told Yahoo Sports that he is a musician and his intent was to enjoy the match, "meet the cheerleaders," and "create some good political satire." Howard only had a few moments in front of the crowd before two men, who are suspected to be employed by the North Korean regime, attempted to remove him from the scene. "They shouted something in Korean, I wasn’t sure what it was," he said, "and then the police got involved and they dragged me away – they said for my own safety." Social media users and journalists were quick note the visible discomfort of the women in the cheerleading squad when Howard first appeared. This was the second time Howard made waves at the 2018 Olympic Winter Games. During the opening ceremony, Howard and an impersonator posing as President Donald Trump attracked media attention. This entry was posted in Culture and tagged Kim Jong Un, North Korea. Bookmark the permalink.